The castle of Viipuri was founded during the Third Swedish Crusade in 1293 by the order of Tyrgils Knutsson (Torkel Knutson) to protect a busy trading post against the invasion attempts coming from the east. The place was not selected randomly; instead the old, demolished Karelian fortress was already familiar to the Swedes through mercantile connections and raids. Right after the capture by the Swedes, the building of a new stone castle begun. The first attack from Novgorod came as early as in 1294. The Treaty of Nöteborg in 1323 solified peace and also created requisites for the growth of Viipuri. It is known that in 1300 habitation had moved to the spit of land on the South-East side of the castle. Soon habitation overtook the spit and people started calling it a town or Civitas. 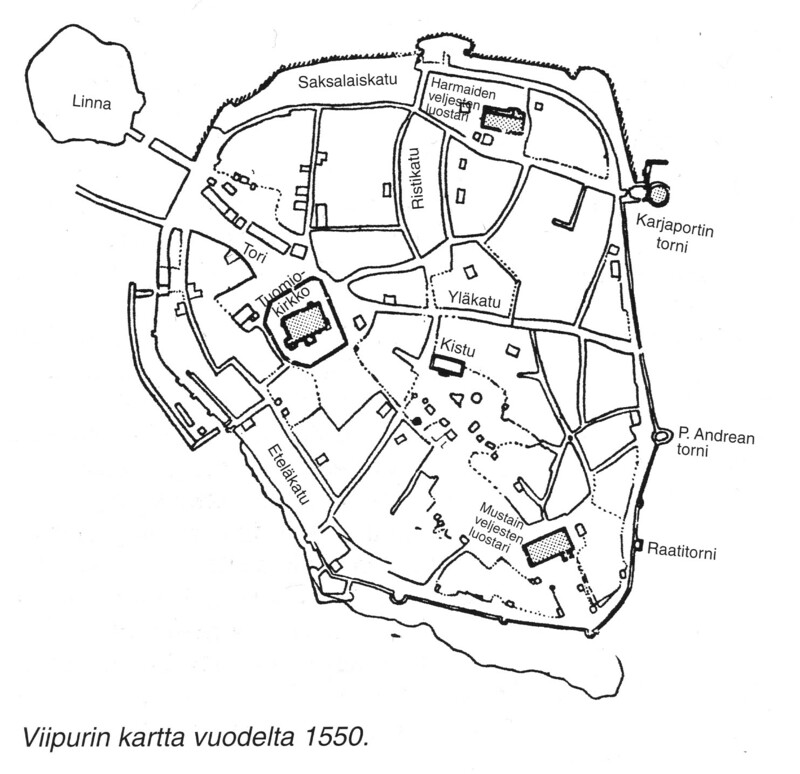 The earliest reference to Viipuri as a town can be found from the archives of Vatican 1350’s, even though Viipuri did not have legal town privileges. In the beginning of the 14th century Viipuri was granted trade rights and in 1403 the habitation which had overtaken the spit received town privileges from Eric of Pomerania. The charter of Viipuri from 19th of August 1403 in its original form, given by King Eric XIII. Wy eric mz gudz nadh Swerikes danmarks norghes wendes oc godes konung hertugh j pomeren kunokt györöm thz mz thætte wart opne breff allom mannom swa the nu aere som the hær aepter kome scule at wy hafvom vnt oc gifuet ware borghere som bygge oc bo j war kijöpstadh wyborgh stadz raet aepter thy som stadz boghene j Upsalom wtwyser, Thv forbyuthom wy allom warom foghedom oc aembetzmanom oc allom androm aeho the haelzt aeren, at hindre thöm j naghre made haer amot Swa frampt the wyliu ware hylle hafue oc war hefnd fly Jn Euidenciam premissorum seeretum nostrum presentibus duximus appendendum Datum in castro nostro Wyborgh Anno dni m cd tertio dominica jnfra octauam assupcionis virginis gloriose. Churches were the first and dominating buildings in Viipuri during the middle Ages. The building of a stone cathedral begun in 1418 but it was destroyed in the fire which ravaged the city in 1477. The construction of a stone abbey of the Black Friars begun in a new location in 1481 and the abbey of the Grey Friars most likely in 1455. The Lutheran Reformation closed down the monasteries in the early 1520s but the church’s importance did not diminish. The construction of stone walls around the city itself, very close to the coastline, begun in the 1470s, by the order of Eric Axelsson Tott. The walls contained separate fortresses, the most famous of which may be the St. Andrew’s fortification, where the famous Viipuri blast took place on the 30th of November 1495. The governor of the castle was then Knut Posse. In the late 15th and the early 16th century, several stone buildings were built in Viipuri and the town became quite fully built in the 1550s. Even though the town did not have a designed street plan, a usable (although narrow and sparse) street grid had formed. Most of the streets were paved and later excavations have even uncovered a primitive sewer network in Viipuri. The northern waterfront was called Alakatu (“Lower street”) or Saksalaiskatu (“German street”) and the habitations of Germans and other rich townsmen were situated there. Officials liked to settle across the road from the castle. The most central street which was located on the highest point of the city was Kuninkaankatu (“King’s street) or Yläkatu (“Upper street”) and the town hall was near it. The crossing street which ran through the city was called Ristikatu (“Cross street”) and it ran by the town hall into the harbour. The closest street to the harbour was Eteläkatu (“South street”). In the southern parts were located the buildings which served the harbour: warehouses and the workshops of the craftsmen and smiths. The wharf was a separate construction outside the town walls ranging from about 100 to 150 metres. Habitation had spread outside the walls, mainly to west due to security reasons. The trade in Viipuri was governed by Germans, Swedes and Dutch who all had good trade connections to Central Europe. The most important imports were cloths, salt, spices and other products not available in the northern latitudes. Exports consisted mainly of furs, tar, butter products, seal oil and dried fish. There were no industrial plants within the city but in the surrounding countryside there were flour mills, sawmills and brick factories which were built by the side of rapids and other waters. Due to its busy merchant activity, the city itself hosed several different guild halls and wine houses, where the merchants visiting Viipuri liked to quench their thirst. The custom was that pubs, beer houses and the city gates were closed at 9 PM, after which only the night watchmen moved along the dark alleys to cool down noisy drinkers. In this respect, lifestyles have not much changed during the past centuries, even though a lot of education on the matter has certainly been given. Because of the development of warfare, especially after gunpowder and artillery become more common, the construction of a new fortress began in 1547 by the commission Gustav I of Sweden. This Karjapihan torni (“Stockyard tower”) or the Round Tower was built in the south-eastern end of Saksalaiskatu (German street). The Tower was completed in 1550. It was a separate building outside the walls. Soon after the tower was completed, it was discovered that the town desperately needed new sites for plots and that the walls build for defence did not fit the requirements they were subjected to. In 1562 king Eric XIV sent the master builder Anders Målare into Viipuri. 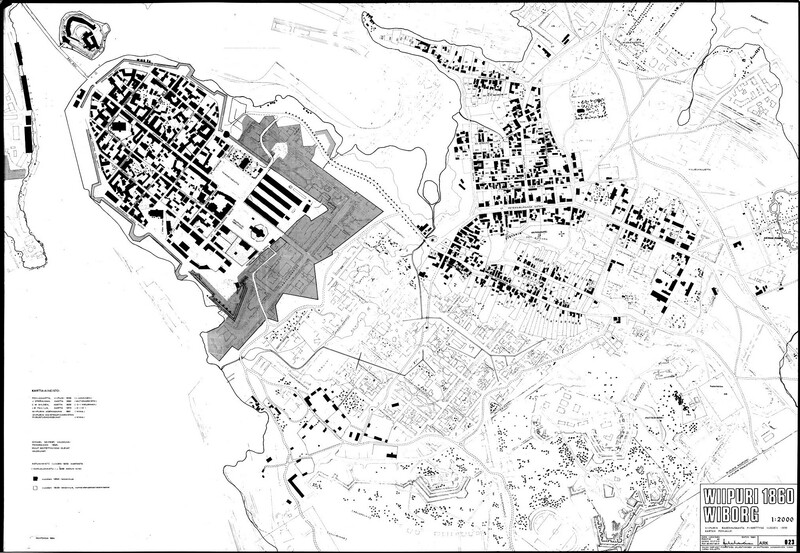 His assignment was to design new city walls and within the walls a new town plan complete with the plots. The new walls were built connected to the round tower and fortresses were built in the corners. These Sarvilinnoitukset (“Horn fortresses”) were named the Bastions of Äyräpää and Pantsarlahti. The new fortifications and the new zoned plots were finished by the end of the 1580s and this new part of the town was generally called Valli (“Embankment”).182 new plots were founded there. Viipuri had now got a new quarter based on the new town plan, being the first of its kind in Finland. The roaring fires of 1620s in the old town give cause to re-examine the town plan and other provisions. In the old, un-planned town, deteriorated chimneys, courtyards, unkept backyards and narrow streets enabled the fire to spread through the entire city. In the densely built city, the citizens started to rebuild houses into their old places after the fires and this is when the magistrate interfered. In 1638 General Governor Per Brahe arrived at the town. He decided that a new town plan with straight streets and rectangular plots must be drawn for the old part of Viipuri. A grid plan had to be drawn and the streets needed official names. By the order of Per Brahe, Stockholm’s first city engineer Anders Tortensson was sent to Viipuri. His task was to draw a new town plan for the old town. The grid plan did not take the existing buildings into account. Only both churches were allowed to keep their existing locations as well as the Piispantalo (“Bishop’s house”). Their location was noted in the new plan. This, too, shows how formidable church was in the Middle Ages. The new town plan came into effect in the 1640s and it was implemented in stages, giving the town the form and scope it retained until 1860. In 1710 the troops of the Emperor Peter the Great conquered Viipuri and it was attached into the Russian empire as its own fief. The Russians ruled until 1809 when they conquered the whole of Finland. In 1809 the autonomic Grand Duchy of Finland was founded and the fief of Viipuri or the so-called “old Finland” was incorporated into it in 1812. In the 1840s and 1850s the city fathers of Viipuri often turned to Peter the Great to let them demolish the deteriorated town walls which were built in the 16th century, simply because Viipuri was no longer a significant military fortress like it had been in the past centuries. The town which was surrounded by walls was about 450 m wide and 700 long. It desperately needed new space for plots because the town itself was built completely full. The construction of the Saimaa Canal and the thought of an up-coming railway connection between Helsinki-Viipuri-St.Petersburg only increased the demolition pressures. The advent of the Crimean War in 1854 changed the situation. After the end of the war in 1856 the military authorities noticed very soon that the walls and fortifications had become obsolete and did not suit their purpose any longer. They were in bad shape and partially collapsed due to not being tended properly. The citizens used the terraces of the walls as farming plots and the surfaces and hollows of the walls were excellent grass areas for sheep and goats to graze on. Perhaps the old legends of the Viipuri goats and embankments derive from those times. Within the military authorities it was decided that new fortifications and forts would be built in the Patterinmäki (“Battery hill”). This took place between 1850s and 1870s. The completion of the Saimaa Canal in 1856 as well as the railway connection made in the 1860s had a decisive impact on the life of Viipuri. By an imperial decree, in 1859 the old walls from the 16th century became the property of the town. The St. Anna’s Crown or the Siikaniemi fortress (built in the 1730s and 1750s) remained in the custody of the military authorities and its demolition was not allowed. The new town plan drawn by engineer Berndt Otto Nymalm was accepted in 1861 after which the deconstruction of the town walls begun quickly. The plotted area of the town increased in sixfold. The new main streets, Torkkelinkatu (“Torkkeli street”) and Aleksanterin katu (“Alexander’s street”) were completed in the 1880s and the last parts of the wall were demolished in the late 1880s. Only the bastion on the Pantsarlahti bay and the walls surrounding it remind us of the past centuries. With the upcoming extension to the harbour, a part of the wall south-west from the Pantsarlahti bastion was demolished in the early 1910s, allowing the harbour area to be expanded. Building in Viipuri was very active from the beginning of the 1890s until the beginning of the World War I in 1914. The war time with its difficulties slowed down construction work. Right in the beginning of the time of independence a post for a town plan architect was founded in Viipuri and architect Otto-Iivari Meurman was elected for the post in 1918. He was forced to plot large areas which were annexed to Viipuri. These included eastern and southern parts of Patterinmäki in 1924 and 1928, as well as northern areas such as Imatra, Carelia in 1924. Western areas, such as Sorvali, Saunalahti, Hiekka, Pikiruukki and Tienhaara were not annexed to the town until 1933. Also Uuras, a separate island where the new so-called grand harbour was being built, was annexed to Viipuri in 1932. All these were partly old residential areas with no town plans or municipal engineering. The field of work for the town plan architect was vast and very demanding. Very quickly he drew up drafts of the new areas and for example the town plan for Havi was resolved very quickly. In practice, all new areas were planned by 1935. The arrangements with traffic were one of the main concerns for Otto-I.Meurman as he already realized the problems coming from the increase in automobile traffic and how they would require major arrangements for main traffic lanes. A period of rebuilding happened right after the mid-1920s when as a result of the planning new dwellings arose in the new one-family house areas. New apartment buildings were built downtown, including the offices of Karjalan sanomat (“Newspaper Karjala”), Viipurin Suomalainen Säästöpankki (“The Finnish Savings Bank of Viipuri”), Viljelys (“Plantation”), parish halls and a large number of apartment buildings in Kullervonkatu (“Kullervo street”), Suonionkatu (“Suonio street”), Pellervonkatu (“Pellervo street”) etc. The renovation of the round tower into a café in 1923 and the Wiipurin Teknillinen Klubi (“Viipuri technical club”) into conference rooms were excellent examples of how to take culturally significant buildings into utilization. When digging the new foundations for the buildings in Viipuri or when opening new channels for water, sewers or electricity; parts of old buildings, basements and graves were often encountered. Similar previously unknown remains sometimes also popped up after heavy rains. From an opened hole it was possible to find ancient rooms or parts of them. This is what happened in 1925 when Hackmann and Co. begun to build a sugar storehouse in the block between Karjaportinkatu and Pohjoisvalli (“Northern embankment”). The constructors stumbled across a group of rooms and arched brick cellars and in the southern corner of the block there was an old graveyard which had apparently belonged to the abbey of the Grey Friars. The sugar storehouse was drawn by architect Uno Ullberg who, after the remains of the constructions were discovered, contacted the committee of archaeological monuments, who sent the national archaeologist Hj. Applegren-Kivivalo to inspect the diggings. A silver spoon with the crests of the families Tott and Kurck was discovered in the excavations. The national archaeologist took the spoon with him into the collections of the National Museum, much to the dismay of the people of Viipuri. Architect Ullberg, for his part, measured the old structures and draw designs of them. The appearance of such relics inspired the architects in Viipuri to think that photographing and restoration of them should be overseen. The idea was developed by the architects Bernhard O.G.Frazer and Otto-I.Meurman. They made a suggestion for the founding of the post for a relics monitor. The result was that the Committee for archaeological monuments wrote a letter to the town council of Viipuri in 1926 and suggested that the city would nominate a relics monitor to make sure that the relics were protected and accessible for scientific use. The matter was handled in the town council in 15th of March 1927 and was accepted. The council allocated 6000 Finnish marks for the latter part of the same year for the employment of a monitor. An additional 12000 Finnish marks were allocated for the following two years. After this, when the Committee’s historical branch had on the 26th of April 1927 accepted the regulation for the post, on the 1st of June the committee nominated Otto-I. Meurman to take the position of the relics monitor, starting from the beginning of the next month. With this money and similar amounts received later, begun the photographing, measuring and designing of the natural stone buildings mainly dating from the Middle ages. The designs were drawn in two copies, and one copy was sent to the Committee of archaeological monuments in Helsinki and the other was given to the Viipuri museum. The latter designs were destroyed in the fire of the Viipuri Historical Museum in the last day of the Winter war on 13th of March in 1940. The total amount of drawings of these buildings, uncovered stone cellars, gateways belonging to earthworks and other structures was about 30. An interesting discovery was made in the southern corner of the island where the Viipuri castle lies, where the ruins of the former Suutarintorni tower were unearthed. Its archways and gates had been partially preserved. The lowest floor was 7 m below the ground level of the island of the present castle. This level opened up a narrow passageway into the inlet between the castle and the town. One master builder of the construction office of the town told that when the inlet was dredged in the 1920s, a part of a brick wall was discovered. (This may have been the other end of a tunnel, which was assumed to be an underwater connection between the castle and the town. A similar tunnel opening was discovered by the Russians in the basement of the former Weckrooth’s house in the 1980s). The greatest investments for the town of Viipuri focused on the construction of the municipal technology of the new suburbs and the extension of the harbour areas. The modernisation of the city theatre built in 1834 required large investments. A large job was building a tramline into the eastern suburbs through Suurkatu (“Great street”), Valtakatu (“Reign street”), Kannaksentie (“Isthmus road”) and Kannaksenkatu (“Isthmus street”). The construction of the wide, new Suurkatu was a vast project in itself. Uuras and the harbour railway constructed in 1926 created a large harbour construction site. A new railway connection to the Viipuri harbour was also constructed from the south-east and it was completed in 1925. The beginning of the 1930s was the time of the Great Depression, but the town nevertheless built new municipal hospitals, houses, schools, a vocational school, a water tower, a bus station (the first in Finland), Art school and museum and the Provincial Archives. The restaurant Espilä was renovated and a large remodelling project was done in the city hall. During the Great Depression the Military hospital, Deaconesses' institution and the Rural District Building of Viipuri were also built. After the Depression had ended, the pace of constructing increased. The harbour was extended vigorously and the town built public buildings such as a library, new hospital for women, summer theatre with seats for an audience of 2000, a vocational school, industrial and saw industry school, new highway bridge for Papula as well as a central sports field (with covered seating for 3000 people and on the other side of the field an uncovered seating. The total number of seats was about 5500 and they were surrounded by standing room for over 10000 people). Several small parks also got their form during that significant construction period. Within trade and industry a wholesale business for Oy Savo-Karjala, SOK-corporation (retail co-operative), a mill and bakery building, offices and storehouses for OTK (wholesale trade) and Hankkija (feed factory) were also built. A lot of houses were built in the suburbs and this lead to the appearance of new service and business buildings as well: public saunas, office buildings for different retail co-operatives, settlement house centre in the east-Toukola etc. Over ten apartment houses were built downtown between 1935 and 1938 and several were renovated and central heating was installed. A view of the future created great expectations and dreams. The year 1939 was welcomed with great expectations. The significant increase in the export income did not only reflect in the increased buying power of the citizens but also in the economy of the town. In 1936 Ragnar Ypyä was nominated as the new town architect and he set to work in designing new school buildings and drew up designs for a future sports palace and concert hall. The implementation of these buildings was interrupted by the upcoming Winter War. A new, younger architect Olavi Laisaari was nominated as the town plan architect after Otto- I.Meurman took the post of the town plan professor in the Helsinki University of Technology. Laisaari set to work on the upcoming traffic arrangements, which included continuing the work on the new railway line started in 1938 as well as designing the new main street heading towards west. The rapid increase of cars also forced Laisaari to look at traffic bottlenecks. The roads around Viipuri had, after all, been significantly renewed for the whole time after the mid 1930s. The tramline conducting wire poles were removed from Torkkelinkatu and Karjalankatu in 1938 and 1939 as they were hazardous to the traffic. The lighting of many streets was improved right before the Winter War. Construction increased rapidly in 1939. New houses were designed downtown and the building of business palaces became topical. Co-operative society Torkkeli began the construction of a new business building in Torkkelinkatu in the autumn of 1939. Viipuri co-operative society bought three plots from the corner of Vaasankatu and Torkkelinkatu with the intention of building a large shopping centre. Designing the drafts begun, but everything remained just a plan. Insurance companies Karjala and Ilmarinen started the construction of a new 10-storey head quarters in Kannaksenkatu and 130 meters long central warehouse of Starckjohann & Co rose rapidly in Havinkatu. Karjalan Sähkö Oy (Carelian Electricity) also started the construction of a new factory in Suonionkatu, but the work had to be ended after only two stories had been finished in October 1939. Hotel Andrea extended its building as the upcoming Olympic Games in 1940 would have brought soccer matches to Viipuri. In 1939 the construction of a 1000-student Jaakko Juteini elementary school begun. The school reached its final height in September but the construction had to be suspended in October. Several residential buildings were built, especially in the town area of Pantsarlahti. At best, over ten downtown plots were being constructed at the same time. In addition, two sites which had already received building permission awaited for the construction to start. The start of the Second World War in September slowed down boat traffic as well since the Baltic Sea had been transformed into a military theatre of operations. Foreign exports were disturbed and for example the acquisition of liquid fuels become much more difficult. The mobilization which begun in October slowed down construction and the starting of new buildings. Other factor which affected the constructions was the requisition of trucks for the use of the Defence forces. Fuel also had to rationed. The same factors also quieted down architect offices and building companies in Viipuri as their employees were drafted. The negotiations which begun in Moscow in October made many people in Viipuri pensive. Some of the businesses transferred their warehouses into Central Finland and other unnecessary material was also moved to safety. Most of the inhabitants, however, believed that a war would not break out. The world collapsed on the 30th of November 1939 when the Soviet air forces attacked Finnish cities and the Red Army crossed the nation’s borders on the same day without a declaration of war. The war had broken out and the life in Viipuri slowed down as the people moved away from the town because of the continual danger of attacks by air. The town was empty of civilians after mid-February and all activities had been closed down. The front line neared Viipuri as the military operations progressed and the last battles were fought in the eastern suburbs, in the east and south sides of Patterinmäki, where the front line stopped around noon on the 13th of March 1940. On the 12th of March 1940 the peace treaty was signed in Moscow. The treaty forced Finland to surrender to the Soviet Union the Karelian Isthmus – including Viipuri and the areas north of Ladoga. Finland lost 10 % of its area and 12 % of the population had to leave their home areas. Finnish Viipuri of 86 000 inhabitants was no more. President Martti Ahtisaari, who was awarded the Nobel Peace Prize in 2008, was born in Viipuri in 1937.